Parts of Saturn's main rings appear dark in backlit views, particularly the dense B ring (as can been seen in PIA14934). However, some rings are comparatively tenuous and made up of dust particles that tend to scatter light in roughly the original direction it was traveling. This is called "forward scattering." Because of forward scattering, rings like the F ring, which encircles the outer edge of the main rings, appear to glow brightly at this large viewing angle. 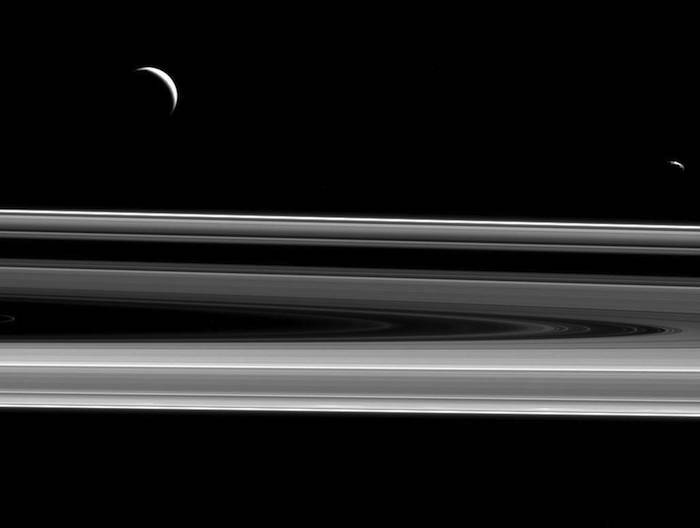 Two moons hover above the rings from this perspective -- Enceladus (313 miles or 504 kilometers across), at left, and Janus (111 miles or 179 kilometers across), at right. The view was acquired at a distance of approximately 750,000 miles (1.2 million kilometers) from Saturn and at a Sun-Saturn-spacecraft, or phase, angle of 136 degrees. Janus' brightness was enhanced by a factor of two to improve its visibility in this image.